In dental practice x-ray of the teeth is the main method of diagnosis, allowing the specialist to carry out dental treatment after visualization of the existing pathologies. This helps to avoid excessive tooth and other unnecessary manipulation, often leading to removal of a previously healthy tooth. The possibility of a doctor during a routine examination of the cavity is limited by the naked eye can assess the state of the crown of the teeth and of the mucous membrane, to correctly set the depth of the carious process and the status of the root canals without the help of additional methods of examination is possible only after removal of a large volume hard tissue, which is extremely impractical. Radiography allows to visualize all the pathological processes developing in the thickness of the alveolar process of the jaw and the roots and also helps to control the quality of endodontic treatment. X-rays of the teeth can be done either on first appointment to diagnose the state of the dentition, and after treatment for quality control of the conducted activities and evaluating the development of identified pathology in the dynamics. Many diseases of the oral cavity occur without any symptoms and is often diagnosed late, when conservative measures are powerless and treatment option for single – tooth extraction. Most often this situation occurs when the development of cysts at root tips to identify which is impossible without x-rays. The lack of teeth or presence of supernumerary. Delayed eruption of permanent teeth. A suspected inflammatory process in the periodontium. Assessment of the volume of the carious lesions, the detection of hidden carious cavities. Difficulty eruption of wisdom teeth. In the course of endodontic treatment is to check the depth, permeability of iskrivlennoi, quality of processing and filling a filling material root canal. Diagnosis of consequences of traumas, fractures of the jaw, the roots and crowns of teeth. Detection of tumors – cysts, tumors in the periapical region. In preparation for orthopedic treatment to assess the condition of the periodontium of the abutment teeth. Diagnosis of complications occurring after removal. Suspected inflammation under removable dentures and in the field of implants. READ Ophthalmoscopy (examination of eye) – what is it? Intraoral: contact, interdental, occlusive, long. Most often in the dental practice intra-oral x-rays. It can be used to identify most of the abnormalities of the teeth and surrounding tissues, while in the picture is visualized from two or three adjacent teeth, making it more informative. Contact radiography is carried out according to the rules of isometry and allows to obtain images of teeth, the size of which corresponds to the true size of the mouth, however, due to the oblique direction is not visualized mezhalveolyarnyh ridges. For the assessment of ridges and periodontal interdental do in General radiography, allowing to obtain images of the end divisions of the alveolar process. In addition, interdental teeth x-rays helps in diagnosing the degree of resorption of bone tissue, as well as in the early detection of cervical and contact cavities. Occlusal x-rays (another name for x-rays «apricus») shown in the case of the need to survey large areas of the jaw for 4 or more teeth. Images obtained in the course of the study also show impacted teeth and distopian, concrements in the salivary glands, cysts and tumors of the upper and lower jaw. X-rays of the teeth «apricus» more likely to have patients with limited mouth opening, increased gag reflex and children. Widespread recently got orthopantomography – research, allowing for one session to obtain an image of the entire dentition. It shows all the teeth, upper jaw and paranasal sinuses. This form of imaging is highly informative, shows the status of all teeth at the same time, besides the radiation exposure is not much more than a conventional intraoral x-rays. It is often prescribed to patients who expect implantation after the removal to assess the readiness of the jaw to surgery. READ Which is better: a colonoscopy or barium enema? Contact x-ray film is pressed against the alveolar process of the jaw study. 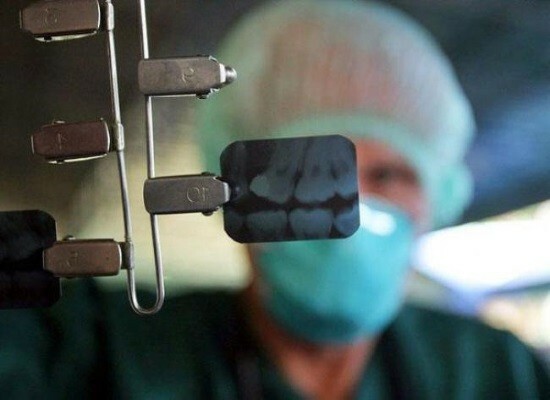 Occlusal x-ray film in a special holding device is clamped between the dental arches. How safe are x-rays and how often it can be done? 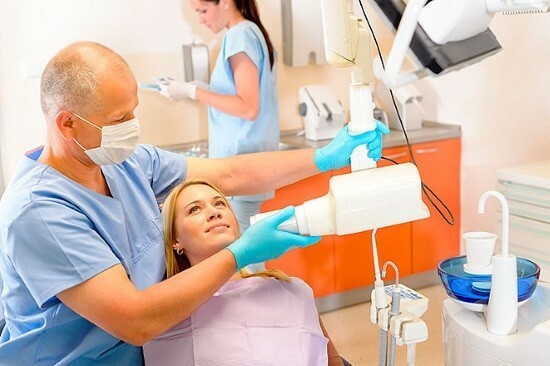 Dental radiography is considered to be fairly harmless procedure as the dose of ionizing radiation received is very low – no more than 0.35 mSv. For comparison, in the course of dental panoramic x-ray exposure is 26 mSv, with CT of the skull is 400 mSv. In natural conditions under the sun, during the day you can also get a dose equal to 0.2 mSv. Refusal x-ray examination may entail more serious consequences, which may result in the removal of several teeth. Why do x-ray after removal of the tooth? Normally, after tooth extraction radiography may be omitted. Quick stop bleeding, the normal process of formation of a blood clot and healing wells say that in the course of removal there have been no violations, then the possible not to do that. X-ray is assigned in the case when the wound is healing slowly, the patient suffers from pain, an unusual discharge from the hole that is healing slowly. In this case, in the pictures you can see fragments of tooth or bone that remain after the traumatic removal of the tooth and causing inflammation. READ How long does the procedure laparoscopy? Correctly decode and to make the description of images can only be a doctor with relevant expertise. He describes the condition of the teeth and surrounding tissues, establishes a diagnosis and is treatment based on what he saw. 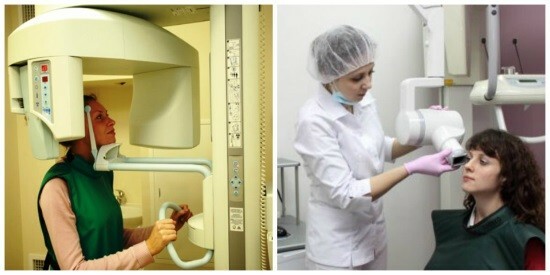 To do dental radiography in any dental clinic, public or private.